I have many faults, but I think my worst one is probably my slothful attitude to mornings. I loathe getting up. It’s partly about sleeping, and partly about hating to leave my warm comfortable bed for a chilly Vicarage. Ideally, I think I would really like to run my life like Mrs Stitch in Evelyn Waugh’s Scoop, who was in bed at 11am when Scoop’s (anti)hero Boot visited her. Although she did staying in bed in a very energetic way, simultaneously signing cheques, dictating details of costumes for charity balls, supervising the painting of a mural, checking her daughter’s Virgil translation and completing a cryptic crossword. On reflection, perhaps being like Mrs Stitch is too ambitious. Now that I no longer have babies who cry for attention at an early hour I need as much help as I can find. I have a few strategies in place (Teasmade by the bed, married a morning person etc) but I know I could probably do a few things to improve my morning sprigginess. So I was interested to see a Wikihow article tweeted by a similarly unlarklike friend this week with a number of useful tips. So I have been trying to win the Battle of the Blankets by getting to bed at least at a time which still features the word eleven. And I’ve been ensuring that getting up is slightly more enticing as an activity. The best thing for me this week in terms of improving my ability to rise from my stupor has been tidying up the post Christmas debris alongside the bed. The attractiveness of getting up surprisingly increases in inverse proportion to the likelihood of skewering my foot on something spikey on the way out. So now I’m off to win that Battle of the Blankets. Once I’ve posted this and talked to the Vicar, and maybe noodled about on the internet for a bit. Still aiming for bed before eleven. Ish. The Engineer is in Year 6 and his class does this ace thing every morning: 20-30 minutes of silent reading before the register. As I reflected on 2015 and my plans for this year, I was struck that I’d not read much other than detective fiction last year. Of course, good fiction is a great thing and I find it very helpful for relaxation. But I thought that I might have not had my reading balance quite right. And I wondered whether I needed to do some silent reading of my own. And then I came across Canadian blogger Tim Challies’ 2016 Reading Challenge. And THEN some clergy wives in a Facebook group I’m a member of started asking if anyone was doing the challenge. I’ve got a few already about the house (am already reading a detective novel, of course, and am using a commentary in my devotions) but I’d love any recommendations you could make in these categories. Particularly a book that changed your life. And I’m going to see if I can manage some silent reading most days. Join me? I am not great at New Year’s resolutions – holidays are such a terrible time for making me unrealistic about my capacity to be Wonder Woman. But over the last few days I have done some reflecting on 2015, and thinking and praying about the year ahead. And actually, I’ve been mulling this over for a while and am hoping that this blogpost will help make my plan more concrete and that this year I will learn to focus better on working one task at a time (and not procrastinating). I found myself very distracted in 2015 [edited to not be a time traveller] and, as a result, not accomplishing what I wanted to. And even more than usual. (Sorry about the complete lack of Christmas cards everyone…). So this year I am planning to Do The Next Thing, with prayer, trusting God for the results. I came across this poem more than a year ago on a poster sold by 52home, and I think it sums up the attitude I want to cultivate. The poster on 52Home says that the author of the poem is anonymous but further research (a bit of googling, let’s be honest) turned up the original author. It’s not Elisabeth Elliot, who quoted it and is cited as the author by some online. The poem is actually a verse of a somewhat sentimental longer original which has rather ‘ye olde worlde’ spelling. It is quoted in a book called Ye Nexte Thynge by Eleanor Amerman Sutphen. The book was published in the US in 1897, and the poem was written by Mrs George A Paull – actually Minnie E Paull (nee Kenney), an author of ‘serial stories’. Minnie was a musician and minister’s wife as well as a writer, and some of her biography is available online. The blog hits from searches on Halloween have begun. So here is my annual pointer to some good ways for Christians to redeem Halloween without drowning in a sea of witch masks and ghoul costumes. This is a great time of year to bless our neighbours and reach out with the good news of the light that Christ brings to our dark world. One popular activity in many churches is to hold an alternative party. 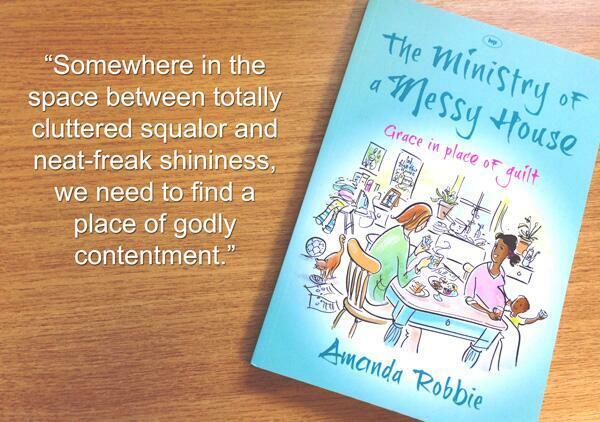 We’re making our Messy Church next week a Light Party. This year Scripture Union sent us a magazine with some excellent ideas for games and activities that we have used. They have free packs and downloads available. We found last year that a light party held on Halloween itself isn’t so popular as people are off to other parties so that’s why we’re holding ours before half term. The next door parish are holding one on 31st October, though, so we’ll encourage any parents who do want an alternative to go along to that. We are wondering if we still have time to get kids a Bag of Hope from UCB. But if your party is in half term, you should be fine. Here in the Vicarage we’re stocking up on tracts (try 10ofThose or The Good Book Company) and sweeties to give to Trick or Treaters. And we’re planning our pumpkin carving. Dreamer is holding some afternoon drop in activities in the church hall over half term and plans pumpkin carving as an option. Last year we carved ‘Light of the World’ on ours, inspired by a gallery of other people’s pumpkins I posted a few years back. 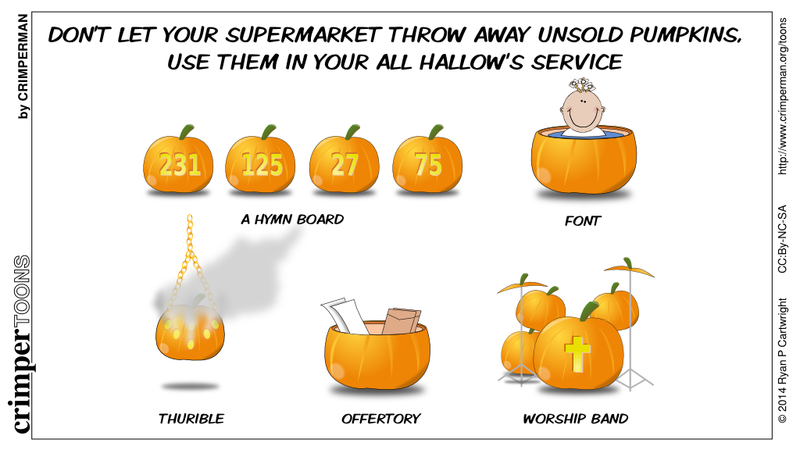 The excellent cartoonist Crimperman has some other ideas for pumpkins, in case you end up with too many. I have found from bitter – and tasteless – experience that supermarket Halloween pumpkins are utterly hopeless for roasting or making into soup or anything really useful.